Chancellor, Vice-Chancellor, honoured guests and graduands, it gives me great pleasure to be presenting today Stephen Page, for the award of Honorary Doctor of the University. Stephen Page is Chief Executive of the independent publishing house Faber & Faber Ltd, which remains one of the world’s leading literary publishers. This award-winning, modern publishing house is renowned for retaining its core commitment to literary values and longterm relationships with writers. Established in 1929, Faber boasts no fewer than six Booker Prize winners and a remarkable 12 Nobel Laureates, among them one of its own former employees, T.S. Eliot who was an editor at Faber for almost 40 years, working to establish the reputations of authors such as W.H. Auden, Stephen Spender and Ted Hughes. This year’s Nobel Prize Winner for Literature, British author Kazuo Ishiguro is published by what is rightly seen as one of the world’s most important and treasured literary publishing houses, Faber & Faber. Indeed, Faber is remarkable in being one of the few publishers who make a real commercial success from publishing poetry. Today this great publishing house is led by another great, inspirational leader, Stephen Page. Since 2001 Stephen has been head of Faber. During that time the media business has experienced an extraordinary period of change and Stephen is widely credited with having ‘brought the house that T.S. Eliot built’ into the modern digital age. He is a leading thinker in how the creative industries can embrace digital media. And is also firmly of the belief that there is no logical reason for the industry to be so London-centric. Whilst he may describe his entry into publishing in rather modest terms he has shown tremendous commitment and passion, which has been recognised by the industry. Under Stephen’s tenure Faber was awarded Publisher of the Year at the Bookseller Industry Awards in 2006 and Independent Publisher of the Year in 2011. To name but a few of his other accolades, he has been a keynote speaker for World Book Day, received the Vista Award for Industry Achievement and was named as the Most Inspiring Digital Person at the FutureBook Innovation Awards. Stephen manages while running the most ambitious and demanding literary house in the world to focus down onto every individual piece of writing Faber handles. To each work he gives a personal, heartfelt and highly intelligent response. How he manages effortlessly to move from the large picture to the small is proof, I guess, of his grace as a person and of his extraordinary gifts as a publisher. Here, the University’s College of Arts, Humanities and Education has benefitted directly from Stephen’s expert and invaluable advice. He was a key contributor to the development of our first master’s level publishing programme. We are very proud that our very first cohort of those publishing graduates are receiving their Master’s degree today. This is just one of ways Stephen has enriched publishing education and the creative industries for he is committed to improving inclusivity and diversity within publishing. He is a passionate supporter of publishing apprenticeships and an advocate for the professionalisation of recruitment to the industry. This resonates with the University’s core aim of equipping our students with the skills to win demanding, competitive graduate level jobs. 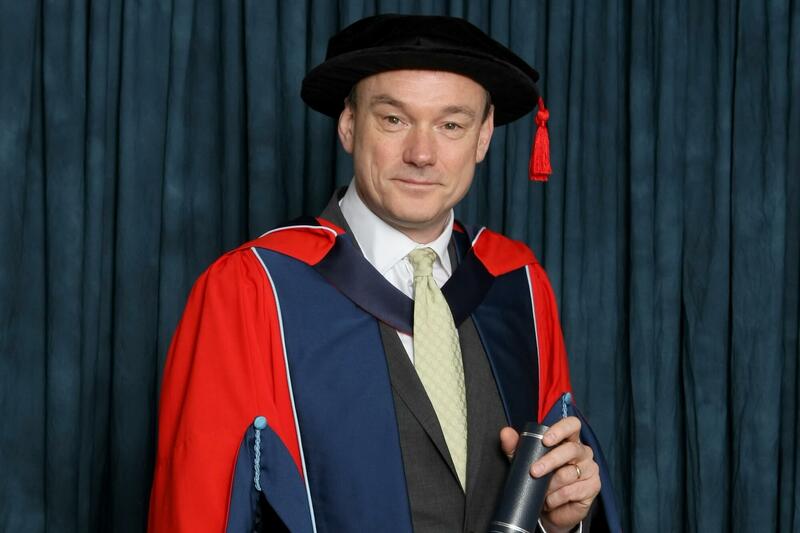 Chancellor, in recognition of his outstanding contribution to publishing education and the creative industries and for the professionalisation of recruitment to that industry, we are delighted to award Stephen Page the honorary degree of Doctor of the University.